When planning time abroad, why not let 1st Class Limos chauffeur-driven service take all the stress out of your airport transfers. We can send one of our stretched limousines to collect you directly from your front door anywhere in and around the Reading Berkshire area, with complimentary drinks on-board, chilled and ready for the long journey ahead. Whether you’ve planned a family holiday, hen or stag party, wedding transfer, birthday celebration or a corporate event, we have a limousine car available for you to hire to suit your travelling needs. At 1st class limo hire we also cater for groups of up to 16 passengers with one of our stretched hummer limousines or our karaoke party bus limo in candy-apple red. Hiring one of these vehicles is a great choice of transport for getting your holiday started in class from when you first step foot inside one our luxurious chauffeur driven vehicles. 1st class limos can pick you up from anywhere in Reading Berkshire or and take you to your chosen destination; we cover most major airports including London Gatwick, Heathrow airport, Luton, Stansted airport, Bristol, Birmingham airport and all off the smaller surrounding city airports. Our chauffeur will gladly help load and unload your luggage, offering a friendly and helpful service. On your return, our driver will be waiting for you in the collection area of the airport to ensure your transfer run smoothly; drinks on ice await you for a relaxed atmosphere for the long journey home to Reading Berkshire. At 1st class limos we also hire out our stretched limousines in Reading Berkshire, which seat up to 8 passengers. These include our classic white Lincoln town car, our vanilla white Chrysler and our silver Chrysler Baby Bentley; all offering a sophisticated ride with champagne bars, mood lighting throughout and top of the range audio systems. These 8-seat limos are able to accommodate up to 6 large suitcases or 8 small/medium suitcases and hand luggage. 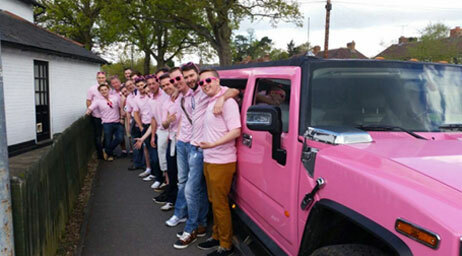 For the larger groups, we have the 16-seat pink stretched hummer and our 16-seat party limo karaoke bus, which can both accommodate up to 16 medium size suitcases and hand luggage bags. These limousines boast champagne bars, amazing lighting displays, top of the range audio systems, a disco floor in the pink hummer and a karaoke system with over 2,000 songs to choose from in the party bus limo. So, whether its sophistication or fun, 1st Class Limos can hire a limousine to suit you. Our 1st Class limousine chauffeur-driven airport transfer service is available to you in Reading Berkshire and all surrounding areas of Oxford, Swindon, Reading, Banbury, Aylesbury, Newbury and Cheltenham. You will find our prices at 1st class limos very competitive compared to public transport and airport parking. Please fill out an online quote form or call the Reading Berkshire office today to find out availability and receive your individual quote; you will be pleasantly surprised.